Brazilian police have arrested 10 people suspected of planning terrorist acts during next month's Rio Olympics, Brazil's Justice Ministry said Thursday. The group was inspired by ISIS and mostly organized online, Justice Minister Alexandre de Moraes said. He said no specific targets were mentioned, but the Justice Ministry is still investigating the suspects' computers and cell phones to learn more about the possible plans. De Moraes said the suspects are all Brazilian nationals, and that one minor was mentioned in the conversations. Another two people have warrants out for their arrests. Authorities said they believe those suspects will be arrested soon. De Moraes said the group was not an organized cell, calling it "absolutely amateur -- with no preparation." The group essentially said, "Let's start training in martial arts, let's start learning how to shoot," the justice minister said. He noted the group tried to buy a gun online, which no organized cell would do. But Brazil has grappled with a host of threats against the Rio Olympics, now just 15 days away. This week, Brazil's intelligence agency said it was reviewing all threats after a jihadi messaging channel called for its followers to target the Olympics, which start August 5. "Many (threats) are discarded and the ones that deserve attention are investigated exhaustively," the agency said. Earlier this week, a jihadi channel on the messaging app Telegram called for attacks against the games and detailed targets and methods, according to the SITE Intelligence Group. SITE said a message was posted to "Inspire the Believers!" saying, "Lone wolf from anywhere in the world can move to Brazil now." The message also suggested using the games to target the enemies of jihad, including Western athletes. Is Rio ready? 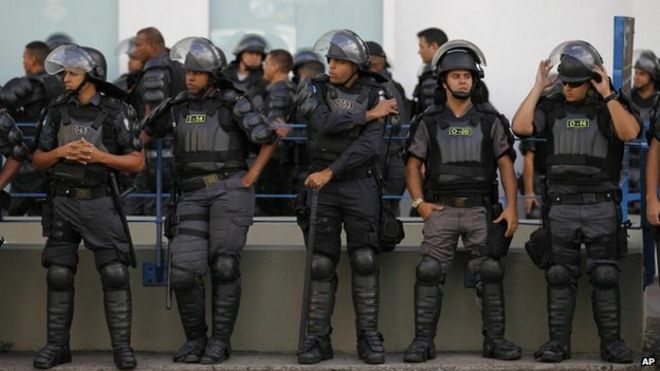 Other Olympic host cities faced problems, too But Brazil has vowed it will be ready to handle any terror attempt. Brazilian forces have been working with French SWAT teams to simulate attack scenarios. In one drill, Brazil special forces and a police dog chase down an armed gunman to thwart a possible attack on Rio's subway system. "There is not a specific threat," Lt. Gen. Luiz Linhares of Brazil's Ministry of Defense said. "You have to screen for a great (spectrum) of threat."